In the middle of Central Florida swamplands and ranch property, Walt Disney aspired to build the greatest American city ever conceived--EPCOT. While Disney would die before realizing this epic achievement, he still left behind the blueprint for one of the boldest and most unique projects ever proposed on American soil. 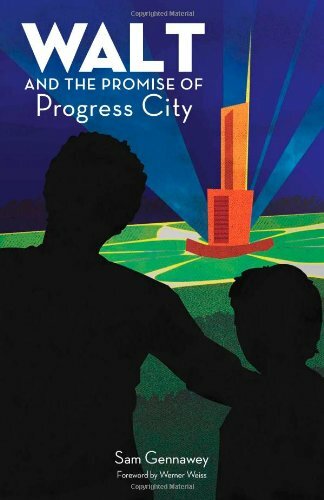 Walt and the Promise of Progress City is an amazing new book that explores how Walt Disney--the master of fiction--was determined to bring new life to the non-fiction world of city design and development and, in doing so, fundamentally improve the Great American way of life. This 374-page paperback by Sam Gennawey explores Walt Disney's vision for a city of tomorrow, EPCOT, and how this great city would be a way for American corporations to demonstrate how technology, creative thinking, and hard work could change the world. Quite simply, Disney saw this project as a way to influence the public's expectations about city life, in the same way his earlier work had redefined what it meant to watch an animated film or visit an amusement park. Gennawey, a professional planner and highly-respected theme park and attractions industry expert, also breaks new ground in detailing the process through which meaningful and functional spaces have been created by Walt Disney and his artists as well as how guests understand and experience those spaces. Gennawey has spent years researching the history of EPCOT and Walt Disney's love for city planning while interviewing a wide variety of key players familiar with Walt and his vision for EPCOT. "[Sam has] captured much of the attitude and events of the times, and hit on much of Walt's drive and inspiration. [His] research into materials and people who were important in one way or ano the r is exemplary. The notes from Buzz Price, John Hench and Marvin Davis, for example... the apparent influence of Victor Gruen's theories...a relationship that developed with James Rouse - all insightful. It is clear, well researched and useful and thoughtful to anyone studying urban planning."